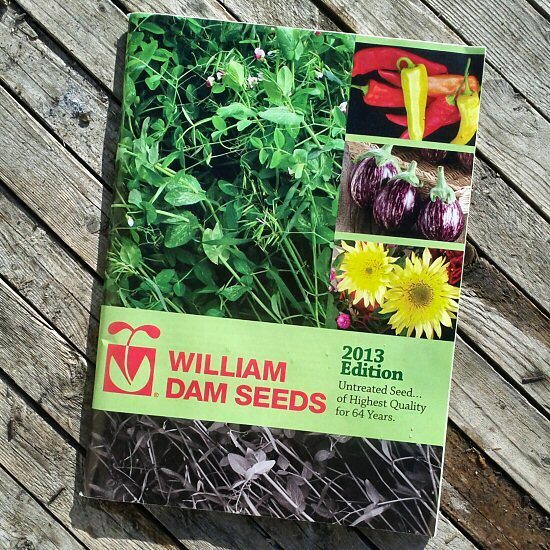 For the record, this year’s seed catalog! It arrived in late December, and I’ve been thumbing through, but it’s still not well-worn—I pretty much know what I’m ordering. It’s as exciting as always to get the new catalogs, but a bit more symbolic now, start of a new season and all that, than it used to be at the beginning, when I pored over it for hours. Like anything else, do it for a while and it becomes…easier. Also once again for recent years, almost all of my seed will come from just this one place, William Dam, a family owned company not too far from here, that carries only untreated seed. Selection does the trick, service is great, and I like talking to them on the phone. High Mowing and, of course, Johnny’s, both relatively close (Maine and Vermont, to my Ontario), have a lot more in general, and High Mowing is 100% organic seed, but at the moment, I’m fine with Dam! Everyone’s farming has its flow! I like Dam too. Johnny’s is cheaper for those staple I order a large amount of (Red Ace beet and Bolero carrot, mostly), and for a few novelties. But I think their days-to-maturity estimate are wayyyy too optimist, and a lot of their new stuff is gimmicky, like this year’s Salanova, or last year’s flowering brussel sprout. Still, they are top in term of service, and they ship real quick. Yeah, both of those will be interesting! The carrots, particularly…that’s quick. Novelty stuff has never really interested me (other than unusual new crops), but I am a sucker for even-faster, although if they do well, they also bother me a little because they are hybrids that I’d have to rely on being available every year. Not that I’m saving seed…yet. For orange carrots, I’m an ongoing fan of Nelson and Touchon. Nelson is fast, and Touchon has come through in all kinds of conditions. I should check out Bolero for fall. I will check out Touchon one of these days. I see it is rated at 65 days, which fits nicely between Nelson and Bolero. In the same maturity range and OP, I did try Royal Chantenay last season. It did very well in term of yield, and had nice strong tops, but the short and stubby look was not much of a hit with customers. In term of extra-early, I also tried Mokum from Johnny’s last year. In the early spring, it was not any earlier than Nelson, and the yield was lower. Not planting this one again this year. So, for me, it is going to be Sprint as a test, Nelson for the early crop, and Bolero (along with various colored one) for mid- to late-season and storage. Bolero is really an excellent hybrid, you definitely should give it a try. I found that, despite being rated at 75 days, it has an harvestable root starting a little after 60 days. Very vigorous and consistent, I like it much. Yep, I have narrowed my buying down to Dam and Baker Creek. I am excited to try the Groninger Blue leaf cabbage this year.